From the Holy Mountain is a superb travelogue of Dalrymple’s 1994 journey in the present day Middle East, as he frequents places visited in the late 6th century by the medieval Monk, John Moschos in what was then the Byzantine Empire. Delivering a splendid account of how Christian communities have been impacted over time as Islam has ascended to become the predominant religion, Dalrymple’s story is a reminder of the importance that Christianity used to play in this region and that is in danger of being completely erased from this part of the world. John Moschos was a monk who journeyed through the Byzantine Empire (also known as the Eastern Roman Empire) when it was at its greatest extent and the preeminent force in Europe. His journeys with his pupil, Sophronius the Sophist formed the basis for his book, the Spiritual Meadow, which became an important text of the Byzantine era detailing their experiences among the ascetics they met during their travels and which led to the inspiration for Dalrmple’s journey 1,400 years later. 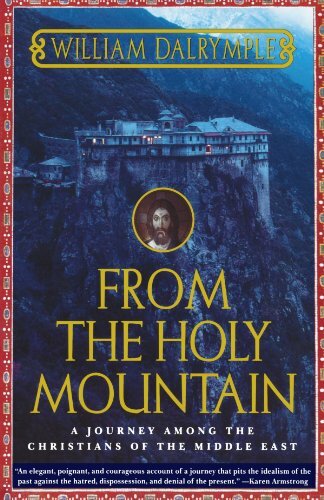 From the Holy Mountain begins at the Monastery of Iviron, on the magnificent Mount Athos, from which the book title is borrowed and which is famous for prohibiting entry for women so as to make living in celibacy easier for the monks on the mountain who have chosen to do so. Having viewed Moschos's original manuscript, he then travels via Istanbul, onwards to Anatolia in South East Turkey before heading south into the Levant. Here he spends time in both Syria and Lebanon, before crossing into the Holy Land and then journeying down through Upper Egypt and finishing at the monastery of Deir ul-Muharraq and the Great Kharga Oasis. Dalrymple’s journey encapsulates how the various Greek, Armenian, Palestinian, Maronite and Copt Christian communities have fared over centuries of Islamic rule, whilst also trying to deliver an understanding of the complex relationships of all the three main monotheistic religions which have originated in the Arab world. During his travels, Dalrymple faced his own dangers with armed conflict taking place between the Turkish State and the PKK in South East Turkey, recent attacks from the Islamic Group against Coptic Monasteries he visits in Egypt and remnants of a civil war in Lebanon that had concluded less than four years previously. On top of all this, Dalrymple also has to endure ungodly wake-up times in order to pray with monks whilst surviving on ascetic meals and fending off well intended religious interventions to save his soul and convert to Orthodox Christianity. Undoubtedly, From the Holy Mountain paints a grim and sad picture of the future for Christians in the Middle East, but it also illustrates how, when done correctly, travel writing can act as a wonderful proxy for travelling to broaden the mind. This is a rich historical travelogue and one best absorbed by not rushing. From its relatively slow beginning, the quality and value of what took Dalrymple four years to write becomes readily apparent, even if the many complex historical and theological layers might take multiple readings in order to get the most out of it. What can't be denied, is that having read it, you will be definitely be enlightened for having taken the time to do so.